Nowhere in Florida is the new law dealing with beach access the firestorm it has become in Walton County. The reason is complicated. But many folks along the panhandle's Emerald Coast claim it's not helping that a pair of local crusaders have a lot of citizens convinced House Bill 631 is the worst thing to befall Florida since Mercury went retrograde. In the last month Dave Rauschkolb and Daniel Uhlfelder -- brothers in activism -- have made themselves the pied pipers of HB 631 repeal -- whipping people up to sign affidavits, attend meetings, donate money -- in a nutshell, "make Florida beaches public for all." Rauschkolb is a restaurateur, Uhlfelder an attorney. Together they're what former seasonal Seaside resident Lilly Bell calls "a tag team," dominating social media and public meetings to get people riled up against each other. "Walton used to have only a handful of beachfront residents who wanted to enforce their privacy all the way to the water," said the retired interior decorator. "But most of them didn't care if people sat on their sand. Then Dave and Dan came along and caught a glimpse of the fame and attention they could get nationally. Now we have a civil war here." The war, she said, is between the "coastal elites" -- residents, guests and tourists who live or vacation along 30A, the scenic beach road, -- and the rest of Walton County. Bell told Sunshine State News, "All you need is a camera, and (Rauschkolb and Uhlfelder) come running. They need to control people. They like to hear themselves talk and read what they write on Facebook. I think they're on some kind of power trip. My late husband called them a tag team." HB 631, was sponsored by Sen. Kathleen Passidomo, R-Naples, and Rep. Katie Edwards-Walpole, D-Plantation. The bill passed the Florida Legislature with an overwhelming bipartisan majority and 100 percent support of the Walton County delegation -- 29-7 March 6 in the Senate and 95-17 March 8 in the House. That's a total of 24 votes against in the whole of the Legislature. No wonder the governor didn't veto it. Why would he? Uhlfelder believes the legislation was a sneak attack -- that Walton was deliberately excluded until it was too late to fight back. Which is why I was disappointed Rep. Brad Drake, R-DeFuniak Springs never returned my call. I would have liked to ask him why he or the county's stable of lobbyists didn't point out 631 to County Administrator Larry Jones, at the very least. Jones, incidentally, did his Master's thesis in customary use. Perhaps he might explain how he could let the county adopt an incomplete and unacceptable customary-use ordinance. Meanwhile, Rauschkolb and Uhlfelder were discovering the high-theater potential of private property rights vs. customary use. They made customary use their next fight for justice. Rauschkolb, who owns three restaurants in Seaside and a bakery/cafe/catering company in Grayton Beach, is used to getting things done. He takes credit for what he calls "game-changing community initiatives" including keeping high-rise condos out of South Walton, founding Hands Across The Sand (to stop offshore oil drilling in Florida); lobbying to remove the Confederate flag from the DeFuniak Springs courthouse, launching an effort to incorporate South Walton, and now something he calls "Stand Your Sand" -- a take-off of Stand Your Ground and an initiative for customary use of Florida’s beaches. Uhlfelder, son of prominent Tallahassee lobbyist Steve Uhlfelder, has worked as a law clerk, staff aide in The White House, in the U.S. Attorney General’s Office, the U.S. Senate, and the U.S. House of Representatives. Now he has his own general law practice on 30A in Grayton Beach. Among his causes, he says he has worked avidly to bring down the Confederate flag. And he believes creating a 501(c)(4) non-profit organization called Florida Beaches for All (FBFA) is the way to "overturn bad law and give citizens the fundamental right to use and enjoy all our beaches. ... I was raised in an environment where you stood up for things, not on the sidelines," he said during a telephone interview. Uhlfelder made national news in July, the weekend after Gov. Rick Scott signed an emergency order supporting open beaches. And that's when his mushroom started to grow -- away from compromise, closer to a move for legislation repeal. In addition, Rauschkolb was interviewed on the Weather Channel, which serves millions of viewers across America. National Public Radio showed up on the beach soon after. So did U.S. Sen. Bill Nelson, looking for an opportunity to kick the governor, his senatorial opponent in November. And between the two proactive "protests" -- Uhlfelder's and Rauschkolb's and what has been described as "dozens of media interview requests," Walton's war for the beach had begun. But some in the county, even the ones who don't live on the beach, have begun to grumble about what this customary-use movement is doing to their jewel of a county, and wonder if there might have been a more civil way for the two sides to come together. The Conspiracy Theory. You don't often find a tin foil hat on a liberal, but Uhlfelder, the registered Republican for voting convenience only, sure is wearing one. This leader so many customary-use advocates are counting on has a conspiracy theory that goes straight to the top. He feels certain Walton County, where the suspicious "Governor Mike Huckabee" is a beach-owning resident, is being victimized by powerful dark forces. Uhlfelder is convinced "right-wing groups" -- for example, the Koch Brothers and the private property rights law firm Pacific Legal Foundation -- have hatched a plot at the highest level to make customary use unconstitutional and to privatize every inch of beach in America. "It's close," he told me. "They could do this in two years." The Hypocrite Factor. Rauschkolb and Uhlfelder both live in communities with gated private beach access. Dave lives in fully-gated Watersound, Dan in Watercolor. To challenge the law and make his YouTube video, Uhlfelder had to contrive his beach outing to Vizcaya -- travel down to the end of 30A more than seven miles away, past some nine beach access points, when he had his own beach. Reading recent Facebook postings, the deception isn't sitting well with some residents. Using the Sheriff. Sheriff Mike Adkinson and his deputies are slap-bang in the middle of the dispute. Adkinson is the right sheriff at the right time for on-the-spot conflict resolution -- patient, good with people, wanting desperately not to arrest anybody for trespassing. "I'm not proferring an opinion of customary use," he said. "My job is to make sure we're not being arbitrary and capricious in the way we apply the law. A sheriff's office should never be the tool to resolve this. ... But I can tell you this: All these people who say 'we're saving the beaches'? No, they're not. The only place this is going to be decided is in court." Overlooking the Good Guys. Some 90 percent of Walton's beachfront property owners are embarrassed and offended to be lumped in with the 10 percent erecting signs and stringing up ropes to keep people off the sand. They don't mind well-behaved trespassers, as their presence on county Facebook sites attests. I asked Uhlfelder if he would entertain compromise instead of repeal. He said no. "You know what compromise is, don't you? It's money. They want us to pay for our own sand." Affecting Tourism. Last year Walton welcomed 4.5 million visitors. Because of such strong tourism, the county records the lowest adjusted property tax rate in Florida. But 2018 might not be as strong if the compulsory-use battle continues. I asked VISIT FLORIDA Marketing Director Meagan Dougherty, by phone and by email, what affect, if any, the beach-access publicity was having on Walton tourism. She did not respond. But another VISIT FLORIDA official answered my question on condition of anonymity. "Hospitality industry people in Northwest Florida are telling us reservations are down and cancellations are up," the official said. "Of course they are. The national media got hold of a story that's telling the nation Florida's beaches are closed." Deception, Confusion. Hundreds of Walton Countians are expected to show up at today's public hearing on customary use at South Walton High School with signed and notorized affidavits. But when they do, many of them might discover they've been misled. 'You mean, our affidavits aren't going to get us back our use of the beaches?" Walton visitor Daniel Flyer asked me. Flyer said he was led to believe the affidavit he signed and had notorized was as good as a petition to repeal the law. Which is what Uhlfelder is urging. He didn't fully realize the hearing was a county meeting set by commissioners to gather evidence of customary use -- citizens' use of the beaches over a period of 20 years -- so the county can prepare an ordinance that complies with the judicial process laid out in the new Florida law. No wonder Flyer's misunderstanding makes sense. If you plan to repeal, why would you need to complete the county's affidavit? I cannot stand the double talk here. You are holding them up as heroes while they tell the national media how this is such an economic catastrophee. How do you think that occurred. Who do you think was trying to get arrested so it could go viral. Your reaction is laughable by tens of thousands who live here and were probably living here decades before you were. Daniel actually trespassed three times on the private property with full intent to do so. Not two, but three. All a big show since his attempts to create an issue with the Confederate Flag fell on their face. Don’t forget the failed attempt at incorporation and telling us our taxes would stay the same. What planet are they on!!!! Hundreds of Walton County property surveys clearly show their southern border at the mean high tide and these are “ not quiet title” properties. Not only do the surveys historically show the boundary at the mean high tide but the title searches and legal descriptions support the chain of title and ownership rights being conveyed. Do your homework and educate yourselves before repeating misinformation as if it were fact. While it sounds as if you were actually present at this morning's meeting for customary use, you apparently failed to notice the number of people FOR Customary Use and the large stack of thousands of affidavits signed by local Beach lovers, both local and out of State, who are adamant about getting the beaches returned to them. The community is grateful that Daniel and David brought this most important issue to the Forefront. Your one sided article makes it sound like they are the problem. Here's the real problem. It's the high-rolling politicians in the community that have caused the issue. It's the judge that grants quiet title to the beaches usurping them from the public without their knowledge. If you want to write a real story, perhaps it should be one that tells the tale of the beginnings of HB631 to now. Name the players involved, the lobbyists, the campaign contributions, the emails and the quiet titles issued. That might be worth reading. Thanks for reporting on the Other Side as no one else will... Probably due to the vicious attacks that come when you do, as witnessed here with these posts from people who don't understand that everyone has an opinion and the right / freedom to express it. Check the Constitution, 1st Ammend. Walton County Lobbied in support for HB 631. Fact check it. Truth. Do a records request on the county attorney and see what they signed off on. Then why isn't the Florida Beaches for All group suing then? That's a fair question. If you have all this evidence, why are you letting them get away with it and not suing to stop this? It's not the job of the media to do that. Look you have a lawyer Mr. Uhlfelder the story says. Why is it that he spends time trying to get arrested (during 2 different days- boy that was rich) on a public beach that's miles away from the private beach community where he lives? I have watched this issue for 2 years. There is some truth to the statement that these guys are a little bit more than in love with themselves and probably made things worse than things would be otherwise. Why don't you make the same request and read and learn? I bet you won't. Just ask for the same request that was submitted and reference the Emails from Lobbyist Horton. Then, do more homework and find out WHO that person is. Don't expect everyone else to do your homework for you. Walton County has had zero enforcement by Adkinson and Code Enforcement. That coupled with no occupancy restrictions in rentals and a lower grade crowd of tourists since Katrina, thanks to aggressive marketing by the TDC, has brought on this problem. Add to it the growing business of "beach chair vending" and you have a toxic mix. Multiply that by incompetent leadership by elected officials and other county staff and you have a great concoction, ready to blow. Without Rauschkolb and Uhlfelder there would no leadership fighting to maintain open beaches. The article is very one-sided and could have been written by the opponents of customary use. They need to keep up the good fight even with the deck stacked against them. Why no comments from the good citizens who support their efforts. Because there’s a few hundred sheep who yell and are annoying and then thousands and thousands of us who are the silent majority. I went with my husband to both the hearing and the town hall that FL House Representative Brad Drake had. I don’t know which one was worse.....he walked out of the ordinance hearing and waited for me in the car after the Comm Chairman walked off stage during the 5th speaker. I left soon as well. We are totally turned off by current officials here and will be voting for all new ones at every opportunity. I have been a business owner and full time resident in So Walton for 20 years. We suffered through Hurricane Ivan, through the recession, and even the BP oil spill when we lost two retail stores and had to work to rebuild until we got enough BP money to restart our business. The impact of this HB631 has already frightened away tourists, some rental property owners are already selling their properties and if we cannot reclaim Customary Use we will cease to exist as we are now. I’m very saddened by the blame being put on two incredible local citizens Dave Rauschkolb and Daniel Uhlfelder, both of who are not collecting paychecks for their efforts to save Walton County. they are real people with real families who are a significant part of a large number of residents who reject recent Beach front owners coming in and claiming “private beach” to the waters edge. We will not go away, regardless of how you taunt us, how you blame and hate across your demographics. we are real people. We live here full time. We have families, businesses, and have invested many many years to help keep Walton County the paradise That thousands come to each year. You can sell your property now at a good price and go to your private island somewhere. Leave us alone. Typical response from a Democrat supporting socialism. Raushkolb is a fraud who lives in a gated community (Watersound) with no public beach access. Take down your wall, Dave, before you start preaching to the rest of us! Gate code please. I'm going to the beach today. don't forget he drives a freakin Tesla but wants to shave 5 minutes off dropping his daughter to school by telling the county to put a road through the state forest. I thank Dave and Dan for their work in fighting to make CU for all! Marie — you’re not going to be thanking them when you realize you signed a legal instrument that makes you a party to a lawsuit — or when your taxes go way up and they blame it on the Beaches lawsuit — or funds are tight for other government services because it all went to this lawsuit. Be careful about being a sheep in this and protect yourself. Unless you’re a Realtor. Then join the sheep. Some of us are angry about how the Realtors got into this. Licenses could be at risk. 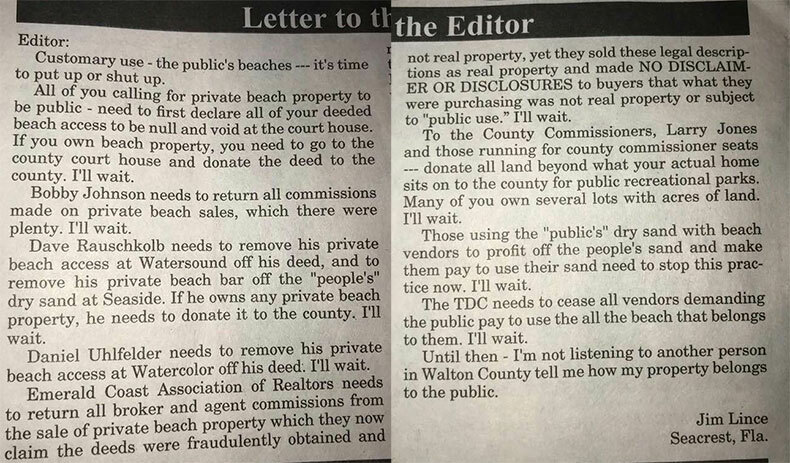 This article includes an extremely skewed opinion that seems to have any real relevance to what is happening to public beach use in Walton County. Why did Walton County allow so much development on the beach? I think they made some bad decisions years ago and now they want to blame the legislature and everybody else for them. It’s an absolute shame that these two blow hards have the population up in arms over a simple problem that is easily fixed by getting just a couple of smart business minds together. They chose to mislead the masses with their propaganda and willingly damage the tourist economy, all for the hope of personal political notoriety. They refuse to engage in public or private discussion with anyone that can prove their false mission. Vain Cowards, we all have met these bullies before, haven’t we? We will all feel the pain as these two children play house with our county. It is a shame Ricky but it’s also a shame that there are so many sycophants being led around the nose by these two. I know some of the real estate people helping these two circus guys get people overstimulated, and with the exception of one or two (who will say and do anything for a sale), they are very smart people. They are stepping in it on this. I certainly wouldn’t recommend any of them now to anyone looking to buy or sell something here. People need to boycott ECAR.